In today’s world, with cars, television, computers and time spent working in the office, most people spend too much time sitting in chairs. According to research, sitting for eight or more hours a day without exercising poses a health risk that is as serious as obesity and smoking. Sitting too much puts you in an unnatural posture that stresses your back, legs, arms and shoulders. Ultimately, this can lead to pain in your back, neck, spinal disks and joints. As people are becoming more prone to such conditions they are fighting back in many ways. Some by choosing to use standing desks, some by undergoing corrective exercise routines to improve their posture and some by hanging upside down. This is otherwise known as inversion therapy. Inversion therapy is the therapeutic practice of hanging upside down or at an inverted angle with the help of an inversion table. The reported benefits of an inversion table include back, neck, joint and sciatic pain relief, headache relief, improved circulation, mental clarity, posture, muscle tone and flexibility. In this post, we will take a look at what inversion therapy is, how it works and the top benefits of inversion therapy. An inversion table is a type of inversion therapy that works by shifting your body’s gravity, removing pressure from your back and allowing the vertebrae of your spine to decompress with the help of your body weight. It gives you all the benefits of inversion therapy without you needing to turn completely upside down. You set the table to your height so that it can stretch the length of your body, then you secure your ankles into the table and use your arms to rotate the table. Most inversion tables let you control the speed and degree of this rotation. You can start at a 20-degree angle and work your way up to 60 degrees or more, where the pressure on your spine is eliminated completely. It only takes 1 to 2 minutes for your spine to decompress, but you should stop as soon as you feel discomfort. 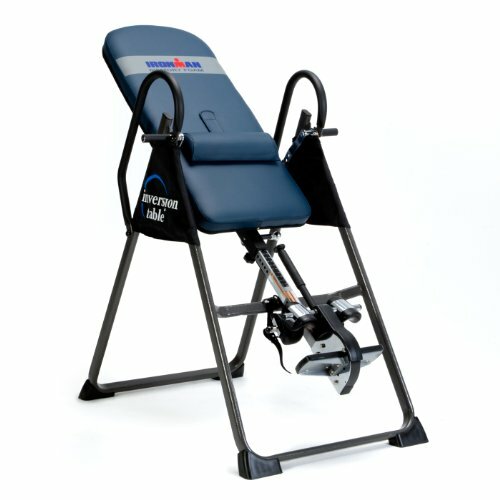 With regular use, you can work your way up to 3 to 5 minutes on your inversion table, or even longer. Using your inversion table frequently is more important than how long you stay inverted at a time. You want to use it multiple times a day for the best results. Watch the video above for best practices for using an inversion table. Is Inversion Therapy Suitable for All? Due to the nature of being held upside down inversion therapy can increase blood pressure, decrease heart rate and place pressure on the eyeballs meaning that inversion therapy may not be suitable for everyone. If you have any doubts of whether inversion therapy is safe for you, always consult a qualified doctor beforehand especially if you have bone, joint or cardiovascular disorders. Studies that support every listed benefit of inversion therapy has yet to be seen. There are some studies that are beginning to appear but most are based on theory. Nonetheless here are the reported benefits of using an inversion table. Long stretches of sitting in chairs slows down your circulation, which can cause fluid retention, varicose veins and even life-threatening blood clots. Putting yourself upside down using an inversion table reverses this effect, as it allows gravity to bring your blood upwards. By allowing your blood to flow upward to your head, an inversion table increases the circulation of oxygen and nutrients in your brain. Although clinical evidence of the use of inversion tables to treat headaches and migraines is lacking, experts know that many migraines are caused by blood vessel constriction and low oxygen levels in the brain. According to studies, increased oxygen levels are linked to headache and migraine relief, which suggests that using an inversion table may be a promising natural remedy. The more you sit, especially if you slouch, the higher you raise your risk for herniated lumbar discs. When you’re slouching in a chair, your upper body weight isn’t evenly distributed throughout your spine. This leads to collagen (the structural protein that makes up connective tissues) to harden around your tendons and ligaments, ultimately causing you pain. An inversion table allows blood to circulate between your vertebrae so that this doesn’t happen. In a study on 47 people with chronic back pain, eight weeks of using an inversion table daily at 60 degrees effectively alleviated back pain and improved torso strength and flexibility. Sitting at an office desk can put a lot of strain on your neck and shoulders. An inversion table reverses the effect of leaning over a keyboard or bending over paperwork, allowing these muscles, tendons and bones to stretch out and relieve tension. Increased blood flow to your brain results not just in more oxygen, but also more neural transmissions that improve cognitive function and boost your mood. When you hang on an inversion table, gravity and your body weight work to align your spine and neck, which can improve your posture with regular practice. It also improves flexibility and your range of motion by improving blood flow between your spine’s vertebrae. By boosting your circulation, an inversion table can help treat varicose veins, which result from the pooling of blood in areas where circulation is cut off. Being inverted drains blood away from bulging veins in your legs and helps it disperse throughout the rest of your body. 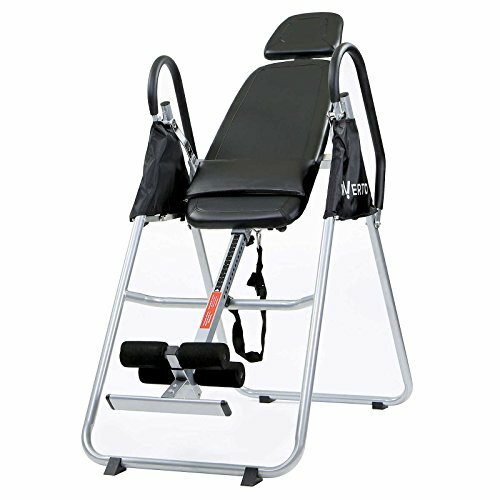 You can also use an inversion table for abdominal strength training. Your abs are muscles that help prevent back pain by improving spinal alignment and reducing your risk of back injuries. 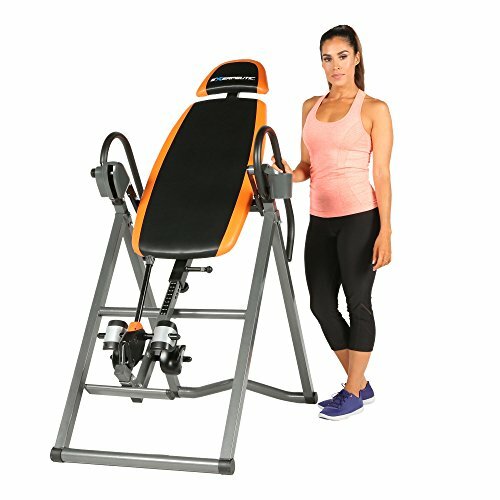 Most ab exercises can injure the back, but doing crunches while using an inversion table makes back injury less likely by relieving spinal compression. Instead of doing crunches on the floor, you can do them while you’re inverted to take the compressive load off your back. You can also try doing inverted squats on your inversion table to strengthen your hamstrings, quads and glutes. Doing an inversion before your regular workout helps loosen up your muscles and boost your oxygen supply. Doing it at the end of your workout will promote better recovery by increasing circulation and decompressing your muscles and joints. The stronger your ligaments are, the more support you have for your joints. Daily use of an inversion table is shown to strengthen your ligaments and improve the lubrication of your joints. As a result, it lowers your risk of disc herniations, spinal stenosis and other spinal conditions. Research has linked inversion table use to stress relief and a feeling of wellness. They cause your brain to release endorphins, which alleviate stress, anxiety and depression, while boosting energy and motivation. Inversion tables for home use are relatively affordable, ranging from $100 to $500, and can be found online or at medical supply and rehabilitation stores. There are a few things to look for when selecting a good inversion table. Adjustability – Inversion tables are not a “one size fits all” unless they’re adjustable for height. Headrest and ankle support adjustments are also good options to have. Storage options – Inversion tables are large, so if you need it to work in a smaller space, make sure to get one that folds up for storage. Quality manufacturing standards – Look for inversion tables made with higher quality materials by brands that value quality manufacturing standards. Comfort – Without enough padding, inversion tables can be painful for your feet, ankles, back and head. Look for inversion tables that provide comfort and protection, especially if you plan to be inverted for more than 3 to 5 minutes at a time. Helpful accessories – Some inversion tables come with added accessories that can provide extra benefits to your back. These can include lumbar support, grip bars for stretching during inversion, acupressure nodes and more. If you’ve decided that you’d like to try out an inversion table AND checked that it is safe for you to do so the next step is to buy one for your own use at home. In this section, we’ll take a look at 5 of the most popular inversion tables available (ranked in no particular order). If you’re hoping to find a low-cost option that enables you to do inversion therapy at home without being a top-of-the-line product, the Invertio table may be a good option for you. Its ankle supports are adjustable and easy to unlock when you’re done with a session. It has easy-grip handrails that help you rotate yourself safely to invert at various angles. The Invertio is a decent inversion table and it gets the job done for a lower price than most tables. 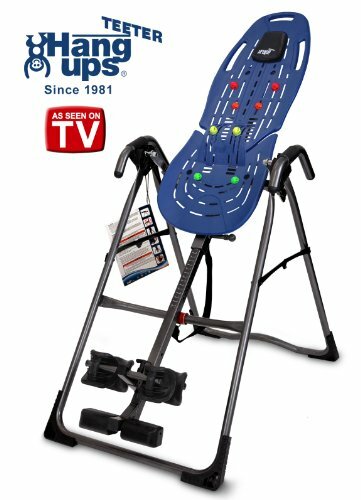 The Teeter EP 560 is registered with the FDA as a medical device, making it the only FDA-approved inversion table. It features acupressure nodes so that your back can benefit not only from being inverted, but also from pressure-point therapy, which is designed to alleviate pain through isolated pressure and release. However, you can remove these acupressure nodes whenever you want to, or you can adjust their height to change the intensity level. The nodes can also oscillate up and down along tracks on the backrest so that if you “seesaw” between inversion angles simply by raising your arms up and down, they massage your back muscles. The table has an adjustable arch at the lower back for healthy back curvature support and better spinal alignment. The ankle cups are designed to have an ergonomic fit and the footrest is adjustable so that your ankles can rest at their most comfortable angle. There are handles you can grab onto while inverted to get a better backstretch. The Innova itx9600 focuses on comfort and adjustability. The backrest is well-padded, the headrest is adjustable and the ankle holding system is designed ergonomically. The way it holds you in place while you’re inverted is different from other tables. It has an angle-slot pin system, which allows you to adjust your angle by placing a pin into the slot that corresponds with your desired angle. Using this convenient system is much like making weight amount adjustments on weight lifting equipment. Whereas tether straps can loosen over time, making them less safe, the padded bars that hold your ankles in place on the Innova hold you in place without the need for a strap system. The Exerpeutic 475sl is constructed with high-grade materials for better stability and durability and is third-party certified for safety. It allows you to hang inverted at 4 different angles, which can be adjusted using a pin system similar to the Innova’s. Its ankle lock system that holds you in place while you’re inverted is easy to reach from an upright position so that you can lock and release yourself without bending down to your ankles. It also has a bar you can grab when you extend your hands above your head during inversion, which enables you to get a better stretch throughout your torso. The headrest is adjustable to 2 different positions for a better fit, and the backrest is designed for comfort, with 1.8 inches of padding. The Ironman 4000 is a more heavy-duty option, as it supports 350 lbs, has a wider frame and is very heavy and sturdy. While this makes for a better option for some people, it also takes up a lot of space and is difficult to move and store. If you’re going for better comfort while inverted, the Ironman is a great option. Its memory foam backrest is 2 inches thick, and it comes with a lumbar pillow for lower back curvature support. Like the Exerpeutic 475sl, the Ironman 4000 has a double lock ratchet tooth mechanism for securing your ankles in place, and you can lock and release it using an easy-to-reach lever. Inversion therapy with an inversion table can realign your spine, reduce nerve pressure, decompress spinal disks and relax your muscles using gravity. The best inversion table for you depends on your body type, the space you have for it in your home and the amount of money you’re willing to spend. 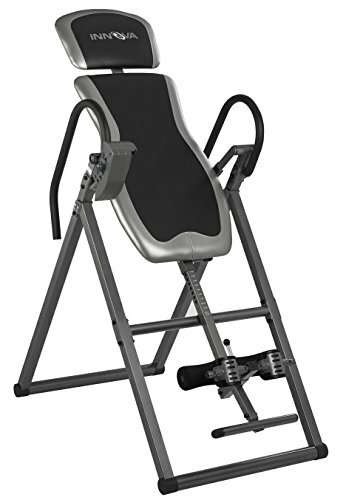 In general, however, a good inversion table is made with sturdy manufacturing materials and has been third-party tested for safety, and is designed to provide adequate comfort and support. You want to use your inversion table every day for the best results, so it’s important to make sure you choose one that’s convenient to use and allows you to feel relaxed while inverted.